Famous Dave’s menu prices at your fingertips! Guests will experience a passion for authentic BBQ when they visit a Famous Dave’s location. Preparation begins at 4:00 am when the pitmasters fire up the smoker. Add quality meat that is rubbed with a custom blend of spices. The result is slow-cooked goodness for all to enjoy. With over 700 awards, you know they must be doing something right. Besides award-winning ribs, the menu includes beef brisket, barbeque chicken, and chopped pork. The menu includes an assortment of sandwiches, burgers, and classic side dishes. Below are the latest Famous Dave’s menu prices. Fans of Famous Dave’s can sign up to join the Famous Nation. Signing up ensures that members receive BBQ tips, the latest Famous news, and special offers delivered directly to their email. Plus, Famous Dave’s will give guests who sign up a tasty gift for their birthday. Make your next catering event Famous! Famous Dave’s catering is a perfect solution to make your next event unforgettable. Famous Dave’s catering offers different levels of service depending on your requirements and budget. Catering service options include Pick-up, Full-Service, or Delivery & Set-up. Guests should contact their nearest Famous Dave’s to get additional information. Famous Dave’s provides guests the opportunity to purchase their famous sauces or spice rubs online. Fans can also purchase pickles, cornbread mix, or marinades. To help you use your purchases, Famous Dave’s also provides recipes for their famous dishes. Check it out. The first Famous Dave’s location was opened June 23, 1994, in Hayward, WI by Dave Anderson. As of 2016, there are 170 locations in 34 states. Famous Dave’s Restaurant is a publicly traded company and is headquartered in Minnetonka, MN. 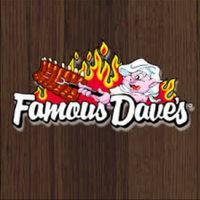 For more information about Famous Dave’s, visit their official website. Is Famous Dave’s BBQ sauce gluten-free? Famous Dave’s does not operate gluten-free kitchens due to the potential for cross-contamination. The menu does not include any gluten-free items. Is nutritional information available for Famous Dave’s BBQ? For guests who have nutrition or allergy concerns, Famous Dave’s provides downloadable pdf files of their menu, ingredients, and allergens used. Does Famous Dave’s offer gift cards? Yes, guests can purchase plastic gift cards at each Famous Dave’s location or purchase them online and have them delivered via postal mail.